Mayor Boris Johnson has scrapped the Londoner newspaper in a move his office claims will save £2.9m. The Londoner, a freesheet, was distributed to three million homes across the city. Up to £1m of the saving will be used to fund the planting of 10,000 new trees in London's most deprived areas, says Mr Johnson. The mayor aims to have all the new trees planted by the start of the 2012 Olympic Games. 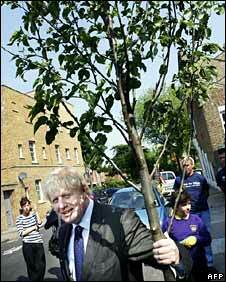 "In the last few years a third of boroughs have seen a decline in the number of street trees," said Mr Johnson. "Many London streets, particularly in deprived areas, have no street trees at all. "I believe that as many areas as possible should enjoy the many advantages that they bring." The mayor plans to work with individual boroughs and charities such as Trees for Cities to compile a list of 40 areas which would most benefit. He was in Brixton, south London, to plant a tree to mark the launch of the scheme.